Summon: Deal 1 damage to your opponent. 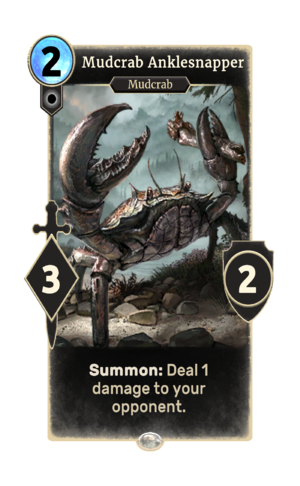 Mudcrab Anklesnapper is a common Neutral creature card. It is part of the Heroes of Skyrim expansion. In addition to the card's availability in the Heroes of Skyrim expansion, three copies are included in the Aela's Companions theme deck.